Famous people born on JULY 4 are Cancer who are unsurprisingly approachable. They are simple… they love life, they are shy, sensitive yet strong. They’re practical and down to earth. But then again, they can be argumentative and moody. However, they know when they are wrong and won’t hesitate to send apologies and flowers. Famous celebrities with birthday on July 4 have expensive taste and it is said that they shop too much. While shopping is therapy to some individuals, they should watch what they spend. 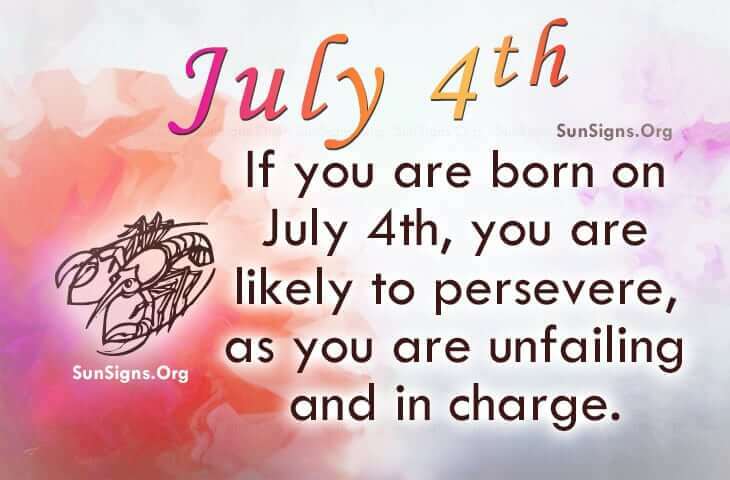 As a lover, famous people born on July 4th can be overly generous and protective. As the occupation of choice, they can certainly be anything they want but their calling could be to take care of others. Or since they like to work out, a fitness instructor could be another consideration. They certainly look great and they feel equally as great and this is only accompanied and fueled by a healthy bank account. Famous July 4th Cancer birthday personalities are generally pleasers. They are likely to persevere, as they are unfailing and in charge of even their emotions. Generous to a fault, they on occasion, forget they are human.